When it came on the scene two years ago, Keynote ( , April 2003 ) was really the first viable presentation tool alternative to Microsoft’s PowerPoint on the Mac. While Apple’s offering surpassed PowerPoint in some areas (transitions, graphics handling, professionalism of templates), it fell far short in others (detailed info on slides during presentations, automatic animation options, slide timing). Keynote 2— unveiled at Macworld Expo and now shipping as part of the iWork ’05 suite—aims to narrow the gap, while adding even more compelling features. Here’s a first look at some of the major changes in the latest version of Keynote. Themes have always been a strong point of Keynote; they are very well designed, and help even the most completely inartistic (yours truly) create visually stunning presentations. 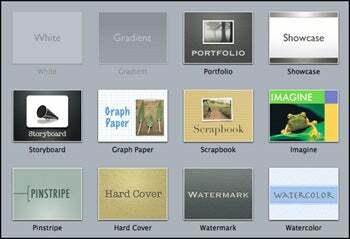 Apple has added ten new themes to Keynote, while removing Leather Book and Sandstone. (If you’d like to keep these extinct themes, see the hint at the end of this article ). As seen in the screenshot, the collection of themes is truly impressive. Some of these themes have been designed to work with other new Keynote features to help create “non-standard” presentations. For instance, you could use the Portfolio theme and the new hyperlinking features (see below) to create an archive of your paintings or photographs that visitors could simply click through to view. Animation of both objects and text has improved greatly. 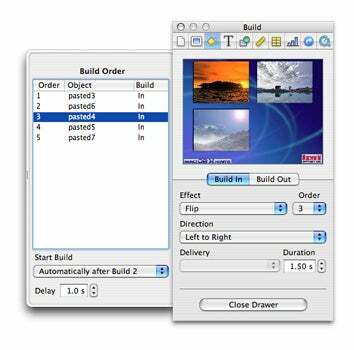 In the first release, there were just nine options for types of “builds,” which is a shortcut term for animating the text and graphics on your slides. In the second release, there are now 26 different techniques, including choices such as iris, twirl, pop, and cube. In addition, some of these build types work on individual words or characters within a line, as seen in this movie, which shows the “character compression” build working on a character-by-character basis. In the previous version of Keynote, build effects could only be applied to entire lines. The other notable improvement has to do with the timing of the builds. In the first generation of Keynote, you could only pick one of five preset speeds for the build, and only the first build could happen automatically—any subsequent builds on a slide required a mouse click. The new version lets you specify, down to hundredths of a second, precisely how long each build should take. Even more important for those creating complex presentations, a new automatic build tool lets you control exactly how subsequent builds are added to the slide—either via a mouse click, or automatically after a given delay, as seen in the screenshot. This gives the presenter a great deal of flexibility in building complex self-building slides. Transitions are visual effects applied when switching from slide to slide. The original version was best known for its rotating 3-D cube transition, whereby one slide seemingly rotated around a cube to the next. The new version adds a very elegant page flip 3-D transition, and seven additional 2-D transitions, including the cool pond ripple effect seen in this movie clip. Finally, if you want to incorporate music, photos, or videos into your presentation, the new Keynote makes it a piece of cake. You can easily set a song to play as a background track for your entire presentation (this wasn’t easily possible in the previous version). 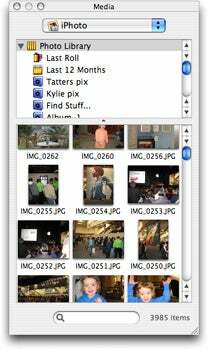 As seen in the screenshot, a new Media Browser makes it simple to integrate pictures from iPhoto, music from iTunes, and movies from your Movies folder. Saving even more time, large images can be masked directly in Keynote, letting you decide just which portion of the image will be visible on the slide. Text handling has also gotten some attention in this update. New features allow you to set extra space before and after paragraphs, and bullets and numbering now have their own tab for easier distinction from text-handling features. You can also embed Web pages directly into presentations. Instead of shooting a picture of a Web page and pasting the image, just insert a Web View, and you’ll have the actual page—and an Update Automatically option will make sure it’s always the latest view, assuming you have a network connection. There are also six new shapes you can add to slides, including two different arrow styles, a diamond, floating “cartoon-style” quote bubble, and an octagon. This gives you 12 shapes to work with, and with full control over fill color or image, transparency, and line type, you can get quite creative. You can also easily add text directly to an object; the previous version required adding a new text layer and positioning it on top of the existing object. Now a simple double-click on an object puts the text insertion point in the center of that object, and you just start typing. Finally, although table handling was already one of Keynote’s strengths, it’s also been improved in this release. The new table tool offers easy creation of row and column headers, precise column and row sizing in pixels, a button to resize cells automatically as content changes, and a set of buttons to quickly select entire rows and columns.